The Bar Council of India (BCI) has started the registration process for All India Bar Examination AIBE (XI) 2018. The Notification of AIBE (XI) 2018has been updated by Bar Council of India (BCI) on August 1, 2017. All India Bar Examination (AIBE) XI a national level examination which is conducted by the Bar Council of India (BCI). All India Bar Examination is conducted with the objective of assessing the capability of an advocate who wants to practice law in India. The Examination of AIBE (XI) 2018 is scheduled to be held on 3rd December 2017. The test is conducted in around 40 cities in India. BCI will award the certificate to those candidates who will qualify the offline examination of AIBE. The candidates qualifying the AIBE (XI) 2018 will be awarded ‘Certificate of Practice’ by BCI. All the aspiring candidates can check the detailed information about AIBE (XI) 2018 from this article. Bar Council of India (BCI) on 2 September 2017 has announced AIBE (11) 2018 application form. The application forms are available in online and offline modes. Candidates are needed to apply for AIBE XI 2018 in online mode through the registration link of the application form for AIBE (11) 2018. It is advisable to all the candidates to read and understand the instructions for AIBE (11) 2018 application form dn registration. 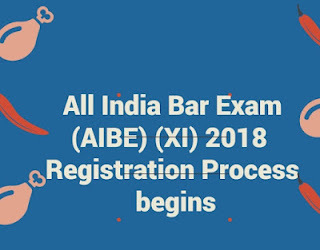 Further, candidates can also check process to fill online application form of All India Bar Examination (AIBE XI) 2018 and other instructions for online application form of AIBE (XI) 2018. AIBE (XI) 2018 Application Form: Instructions for online application form of AIBE (XI) 2018. All the aspiring candidates are required to register forAIBE (XI) 2018 before filling in the application form of AIBE XI. Further, candidates are needed to remit an application fee for AIBE application form as no AIBE XI application forms will be accepted without application fee. Candidates are also required to keep all the required documents ready while filling up the AIBE (XI) 2018 application form. Click on the official link of AIBE (XI) 2018 application (links are given above). Candidates are required to register for AIBE by providing their basic details including name, phone number and e-mail id. Once registration for AIBE (XI) 2018 is over, candidates will receive a confirmation mail for AIBE (XI) 2018 on their registered e-mail address. Candidates will again be needed to login through their registered e-mail id and password to fill AIBE (XI) 2018 application form. Further, before proceeding to fill AIBE application form, candidates will need to generate e-challan by entering their registration number, name and mobile number. After remitting the AIBE (XI) 2018 application fee, candidates will be required to update challan details after logging through their registration id and password. Candidates can next proceed to fill AIBE XI application form 2018. Once the candidates have filled AIBE (XI) application form, they need to take a print out of the AIBE XI application form and also save a soft copy of the same for future correspondences.